Everyone is buzzing about reclaimed wood! Homeowners and designers are finding out that it is both very versatile and beautiful at the same time. With that in mind, there are a multitude of ways of incorporating reclaimed wood in kitchens. Reclaimed wood can be used for floors, cabinets, islands, shelving, furniture, light fixtures, and decorative beams. Despite the trend some people are skeptical about whether reclaimed wood is safe to use in the kitchen because of its unknown history. The reality of the matter is, reclaimed wood is very safe and there are many reasons to use it in the kitchen alone. Because of its history reclaimed wood brings warmth and charm to one of the most used rooms in your home. The popularity of using reclaimed wood for countertops is growing by leaps and bounds. It is a stark contrast to granite and other natural stones. You can use reclaimed wood for countertops by itself or contrast it with natural stone like granite. It sounds odd but the variety in texture really melds well. If you have a modern sleek kitchen and are looking to change it up adding reclaimed wood will do the trick. Reclaimed wood around the kitchen will quickly give it maturity and take it from the present to the past. Using reclaimed wood gives you the chance to put a piece of history in your home that no one else will ever find. Each piece of reclaimed wood is unique and has no match. Although it can be a challenge reclaimed wood does not come in set dimensions. Each board will vary due to its structure. This will give your project a interesting look, but you will have to lower your expectations for symmetry and alignment. For instance, if you use reclaimed wood for an island it will not be perfectly square or rectangle. Although different it will become quite a focal point! If you are going to be installing reclaimed wood in the kitchen particularly as countertops and tables, you will want to seal it. Although reclaimed wood is dense and durable it does still have the potential to absorb liquids and to trap debris in exposed cracks. By simply adding a layer of sealant you will greatly reduce your chance of this happening. Prior to doing so clean your countertop or table with a wire brush which will remove anything loose before you seal it in. This sealing process will also keep bacteria on the surface where you can keep it at bay by daily wash downs with soap and water. 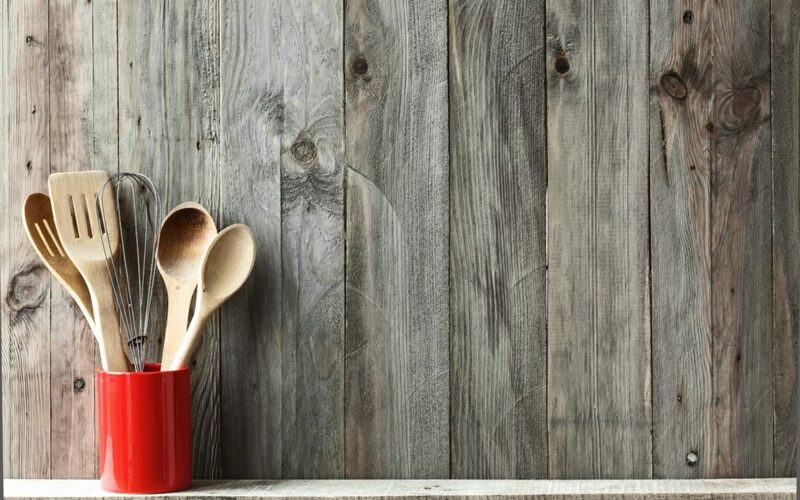 Don’t shy away from using reclaimed wood in the kitchen! You won’t be disappointed, and it will last years to come! Here at Rocky Mountain Reclaimed, we are proud to offer a wide variety of reclaimed exterior siding, reclaimed interior siding, reclaimed flooring and more! If you are interested in ordering any reclaimed products, get in touch with us! We would be happy to answer any questions you may have regarding our product lines.